Flat screen displays at every desk. Headsets and microphones for the team. Bespoke shoot/don't shoot scenarios with weather, threat matrix and area of operations as menu options. What looks like the ultimate multiplayer team game has served a far bigger purpose. This naval battle simulation lab (simlab) led to a game changer in warship design when the Republic of Singapore Navy (RSN) decided to place all key command functions in a single work area. The Integrated Command Centre aboard RSN Independence-class Littoral Mission Vessels (LMVs) is built according to a new operating concept. Admittedly, it sounds risky. But this is precisely why RSN warfighters invested immense time, effort and conceptual studies in subjects such as cognitive task analysis, group dynamics and work processes aboard fighting ships before the 80-metre long LMV achieved its design freeze. From 2011 to 2013, the RSN worked with Singapore's defence science community to plan the LMV from a clean sheet of paper. More than 1,800 works hours were spent on interviews alone to find out how warships are navigated, assess how the crew fights and examine how the health of the ship's vitals like the engines and electrical subsystems are monitored. The LMV simlab built by the Defence Science & Technology Agency (DSTA), the national authority for weapons acquisitions, emphasizes that the change in design philosophy was not a decision taken lightly. The simlab is complemented by a full-sized wooden mock up of the Integrated Command Centre, which brings together the Bridge, Combat Information Centre (CIC) and Machinery Control Room. Click here for more. At the simlab, RSN warfighters were put through realistic scenarios fighting a ship in congested waterways within sight of friendly and hostile shorelines and island groups. Closed up for action stations for missions that lasted up to four hours at a stretch, the RSN warfighters practised fighting a ship exactly as they would on a real deck. All stations had to report readiness state when ordered to do so by the Principal Warfare Officer (PWO). The surface situation picture was closely monitored, with friendly, unknown and hostile contacts dutifully reported as per normal. When the situation turned nasty, the warship would reach out and touch someone with the LMV's warload. This included non-lethal options like the water monitors and long range acoustic devices located aft of the GRP superstructure, to a selection of naval guns from 12.7mm heavy machine guns to the fast-firing 76mm Super Rapid gun. Not every day promised a radiant sunset. The LMV simlab was used to simulate rough seas, rain or haze to challenge the crew in detecting, tracking, identifying surface craft around the ship, by day or in the dark of night. What works for Singapore's LMVs may not be the preferred solution for warships assigned other roles in other maritime environments. 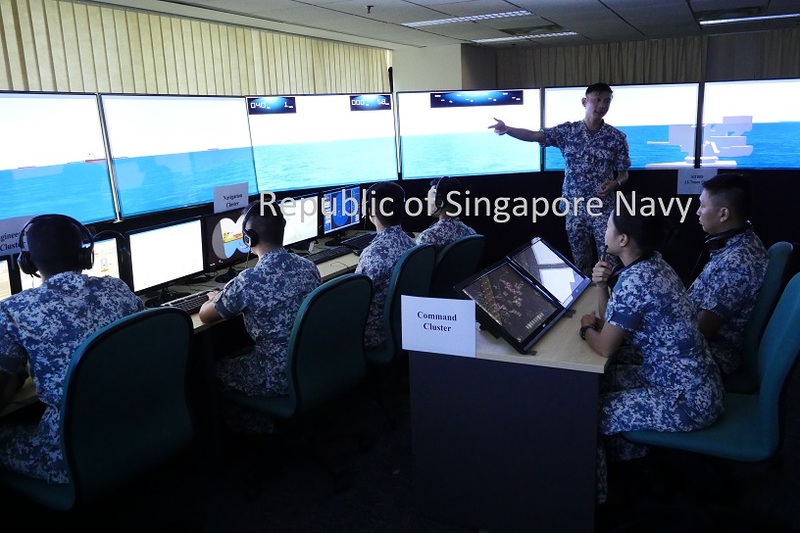 The Integrated Command Centre's layout came about after various configurations were tested and analysed closely. The LMV is designed for the RSN's specific operational requirements, which as the term suggests, is unique to the Singapore Navy's concept of operations for fielding these warships in peace, during a period of tension and in war. While warship survivability weighed heavily on the minds of the LMV project team, the ability of the crew to sail, fight and manage the warship together was deemed essential for wielding information as a weapon. The decision to house the warfighting elements together as seven "clusters" - engineering, navigation, command, surveillance, weapon, network and mission module - in the Integrated Command Centre with a 360-degree view on 02 Deck was arrived at after numerous hours in the simlab. It resulted from close consultation with warship designers from Swedish shipyard, Saab Kockums AB, which designed the LMV hull and cast the Kockums komposit superstructure (click here) in Sweden before shipping the composite superstructure modules to Singapore. The clear cut solution would have been to design and build the vessel along conventional lines with bridge, CIC and MCR located in different parts of the vessel. But the LMV team recognised that fighting a ship in the littoral zone, which is the part of the sea close to land, in congested waterways calls for a radical rethink of warship design philosophy. Indeed, naval encounters have underlined the importance of close coordination between a warship's crew and its electronic eyes and ears for a better sense of its battlespace. In May 1982, the Royal Navy destroyer, HMS Sheffield, was hit by an Exocet missile after reportedly shutting down its radar to prevent interference with the destroyer's satellite communication system as the warship was patching a phone call to fleet headquarters. The destroyer was essentially blind during those vital moments when the anti-ship missile was inbound, when her ability to sense-make was compromised to allow the ship to use her satcoms without interference. In July 1988, an Iranian Airbus on a scheduled commercial flight over the Persian Gulf was shot down by the United States Navy cruiser, USS Vincennes. The disaster stemmed from the CIC team operating close to land amid busy shipping and air lanes. The US Navy ship mistook the Airbus as incoming F-14 Tomcats and initiated the launch sequence which killed 290 passengers and crew aboard the airliner. In October 1992, the United States Navy aircraft carrier launched two Sea Sparrow missiles at the bridge of the Turkish Navy destroyer, TCG Muavenet, after command decisions were communicated wrongly in the carrier's CIC to the Sea Sparrow missile team during a two-sided night encounter exercise. The Sea Sparrows, notionally an anti-aircraft missile system, hit the Muavenet on the bridge, killing the Captain and some of his crew. Once again, a sophisticated warship not lacking in sensors, could have benefitted from better sense-making and decision support systems. When the LMVs are deployed for operational patrols, time will tell if the design philosophy tested and debated vigorously by the LMV project team for years will prove to be an astute decision. The Integrated Command Centre is indeed a radical departure from the norm. It is a game changer that will prove its worth if real life mimics the many naval encounters tested in the simlab. Seriously, with a nominal operational crew of just 23 there's actually little else they could have done, and in-fact seperating the bridge and CIC could actually be detrimental during a high-stress evolution. I mean, putting the CIC in a protected area in the hull might work for a 3300 tonne frigate with a crew of over 70, but not for the LMV. It's also pretty obvious that while the LMVs are more than twice the displacement of Fearless PVs, they will actually have 7 less 'baseline' crew. This means that there's a lot of hull displacement allocated for future growth and modular multi-mission systems - watch the 'construction' video posted on the RSN's Facebook page from the 20 second mark and you'll notice a few 'hollow' modules being installed under the helicopter flight deck. That should be the modular 'flex' deck to handle containerized systems like the Army's medium field hospital, which comes in four standard shipping containers. So for example, if one of our neighbours were to get hit by a serious tropical cyclone, two LMVs could be loaded with the field hospitals, medical staff and medical supplies in a matter of hours and then rushed to the disaster area to provide critical on-site emergency medical treatment. In comparison it takes the Endurance Class LSTs (which are bigger and therefore take longer to load) about 24 hours to load up, so while the LMVs deploy with the more time critical the LSTs can focus on emergency food, shelter and reconstruction. The LMVs should also be able to provide hotel services (electricity, dining, berthing and sanitation) for the medical personnal, and either anchor in shallow water or dock at a pier.